An elliptic surface is a surface that admits an elliptic fibration. Its generic fiber is an elliptic curve over a function field but special fibers may be singular. After giving the Kodaira-Neron classification of possible singular fibers and related geometric invariants, we build the neat connection between the geometry of elliptic surfaces and arithmetic of elliptic curves. This allows us to reprove the finite generation of the Mordell-Weil group of an elliptic curve and to further classify its possible rank and torsion using techniques from intersection theory and lattice theory. The theory of Mordell-Weil lattices plays an important role in finding elliptic curves over of high rank via specialization on elliptic surfaces. Our main sources are  and . See also ,  and . This is a note prepared for the Baby Algebraic Geometry Seminar at Harvard. Definition 1 Let be an algebraically closed field and be a smooth projective curve over . An elliptic surface over is a smooth projective surface with an elliptic fibration over , i.e., a surjection such that almost all fibers are smooth curves of genus 1. Example 1 The trivial family is an elliptic surface. Example 2 The Weierstrass equation defines an elliptic surface over as long as it is smooth. Example 3 By the classification of (minimal) algebraic surfaces, all surfaces of Kodaira dimension 1, all Enriques surfaces and all hyperelliptic surfaces are elliptic. Some K3 surfaces, abelian surfaces and ruled surfaces are elliptic. Remark 1 In the sequel, we make the convention that every elliptic surface has a zero section. So taking the generic fiber of gives an elliptic curve over . We also make the convention that every elliptic surface has a singular fiber. So is a genuine elliptic curve over and cannot be defined over . In particular, this excludes trivial families of elliptic curves. Given an elliptic curve over , there are different ways to extend to an elliptic surface over giving rise to the generic fiber. 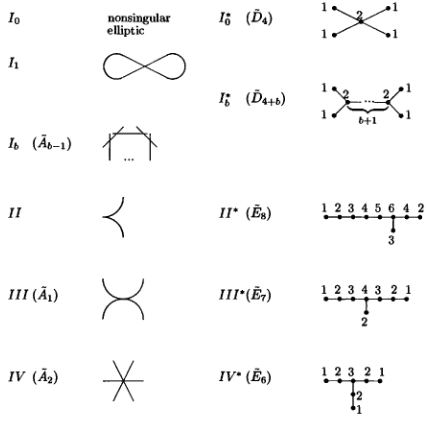 However, all these models are birational, so if we require that is relatively minimal, i.e., the fibers do not contain -curves, then is unique up to isomorphism (the uniqueness will follow from the classification of singular fibers, see [4, II.1.2]). We obtain the following correspondence: The explicit description of the relatively minimal model is given by Kodaira in characteristic 0 and by Neron in general. The elliptic surface thus associated to is sometimes called the Kodaira-Neron model of . As already alluded, the theme of this talk is to relate the geometry of the elliptic surface and the arithmetic of the elliptic curve . How do the singular fibers of an elliptic surface look like? There are many ways to classify the possible singular fibers. Here we use the explicit equations. Example 4 Let be the elliptic curve over . We work locally and take a local parameter . Assume for simplicity, then is given by the Weierstrass equation Assume we have a singular fiber at . Moving the singularity to , we know that and . We change notation and write So if this equation defines an elliptic surface, then we know the singular fiber is either a nodal cubic curve (if ) or a cusp cubic curve (if ). These are called multiplicative and additive reduction (due to their group structures) and the Kodaira symbols are and II respectively. Example 5 It is possible that the equation in the previous example does not define an elliptic surface, in other words, the surface is not smooth. This happens if and only if . Suppose . Then . Let us consider the case for simplicity, then translating gives where . Now we blow up with , , to get One can check that the surface singularity is resolved and the fiber at is the strict transform of the nodal cubic curve (a rational curve) together with the rational exceptional divisor given by This singular fiber type is denoted by . More generally, when higher powers of divide , we need to blow-up multiple times to resolve the surface singularity. The resulting singular type is denoted by , an -polygon of rational curves. It may not be a good idea if I keep on blowing-up for 3 hours. Let me tell you the result instead. In fact, one can determine the singular type from the equation using the so-called Tate's algorithm over any perfect field, as demonstrated above. Remark 2 For those number theorists, the Neron model (a smooth group scheme over a DVR satisfying the Neron mapping property) of an elliptic curve is obtained by simply taking the smooth part of the relatively minimal model. The group structure extends to each singular fiber , which is either or . Here is the component group associated to a singular fiber , which is a finite abelian group. Example 6 One can see that the dual graphs of the singular fibers are exactly the extended Dynkin diagrams . Removing the simple component meeting the zero section, we obtain exactly the Dynkin diagrams . These are root systems with roots of the same length and correspond to even positive definite lattices, with determinants respectively. Miraculously, the determinants are exactly equal to the number of simple components, i.e., the order of . Notice that is unimodular which ends up to be important for us. In fact, a basic result from lattice theory is that is the unique unimodular even positive definite lattice with rank . Theorem 1 Let be the Neron-Severi group of , i.e., the divisors modulo algebraic equivalence. Let be the subgroup generated by and vertical divisors. Then is called the trivial lattice for the obvious reason. This theorem relates the arithmetic of and the geometry of . It is well-known that the Neron-Severi group is finitely generated for any smooth projective variety (the theorem of the base). Consequently, we have reproved the Mordell-Weil theorem using an argument of geometric nature. Corollary 1 (Mordell-Weil) is finitely generated. Remark 3 The finite generation of the Neron-Severi group is proved via the Mordell-Weil theorem of abelian varieties over global fields. So the above argument is a bit circular. However, we can use intersection theory in our case to bypass it. There is a natural cycle map . We have an intersection pairing on and a cup product pairing on . The cycle map preserves the pairings, hence its kernel is the group of divisors numerically equivalent to 0. Using Riemann-Roch, one can show that numerical equivalence and algebraic equivalence are the same on an elliptic surface, hence itself embeds into the finite dimensional vector space , In particular. is finitely generated and even torsion-free. Our next goal is to further study the structure of (e.g., its rank and torsion) using the geometry of . As discussed above, is bounded above by , the second Betti number (it is even bounded by if ). So we need more knowledge about the trivial lattice . Therefore we can really compute the rank of as long as we know all the singular fibers. Conversely, knowing the possible rank of will help us to classify configurations of singular fibers of elliptic surfaces. How about the torsion? The crucial idea is to endow a height pairing. We already know that and possesses an intersection pairing. So it is natural to construct a splitting of this isomorphism so that we can embed into . We need the following theorem due to Kodaira. Theorem 2 (Canonical bundle formula) , and for any , , where . The following is not quite a ``splitting'', nonetheless is good enough for our purpose. One can check that is also a group homomorphism. So we can define a pairing on using the pairing on . Definition 3 Define the height pairing on by . We add a sign in order to make the height pairing positive definite. The following is easily deduced. Proposition 3 Let . Then if and only if . Now from the explicit formula for , we can also write down the height pairing explicitly, where is a positive number only depending on the the fiber components of meeting and . We can apply the height pairing to deduce some information about torsion groups. Recall that is the component group of the singular fiber . The map sending a section to the simple fiber components it meets is a group homomorphism. Theorem 3 When restricted to torsion points, is injective. In this way, the singular types of the elliptic surface impose very strong constraints on the torsion group of , and vice versa. Definition 4 The height pairing induces a lattice structure. We call it the Mordell-Weil lattice. How can we identify with a sublattice of ? A bit of lattice-theoretic and intersection-theoretic computation gives the precise answer as long as is unimodular. Theorem 4 (Shioda) Let be the complementary lattice of in (called the essential lattice) and be the opposite lattice of . Then is an even positive definite lattice. Suppose is unimodular. Then as lattices. We now step toward the case study of rational elliptic surfaces, where the lattice-theoretic method has achieved huge success in classifying all possible structures of . Theorem 5 Suppose is a rational elliptic surface. Then is a unimodular lattice of rank . Here comes a clever way to classify relying on the fact there is only one unimodular even positive definite lattice of rank 8, namely the root lattice . Consider the complementary lattice of the rank 2 sublattice . Then is unimodular, even and positive definite, so it must be ! Since and each is a root lattice. We only need to find all possible embeddings of a root lattice into . If you know , it is just so simple — there are only 74 cases. All the possible shapes of are beautifully classified by Oguiso and Shioda . Remark 4 However, the existence is a problem of different type. People found many examples using explicit equations. Remark 5 Elliptic surfaces are also useful to find elliptic curves over of high rank via specialization. A theorem of Neron ensures that the ranks of infinitely many specializations do not go down. Indeed, all rank records so far are obtained this way (together with searching techniques). The maximal rank of the Mordell-Weil lattice of a rational elliptic surface is 8, as we have seen, and Neron used it to find infinitely many elliptic curves with rank at least 11. Elkies stepped further and used elliptic K3 surfaces with maximal Mordell-Weil rank 17 to find the current record curve with rank . This story probably is the theme of a different talk. Schuett, M. and Shioda, T., Elliptic Surfaces, Arxiv preprint arXiv:0907.0298 (2009). Shioda, T., On the Mordell-Weil lattices, Comment. Math. Univ. St. Paul 39 (1990), no.2, 211--240. Elkies, N.D., Three lectures on elliptic surfaces and curves of high rank, Arxiv preprint arXiv:0709.2908 (2007). R. Miranda, The basic theory of elliptic surfaces, ETS Editrice Pisa, 1989. Kumar, A., K3 surfaces of high rank, Harvard University Cambridge, Massachusetts, 2006. Oguiso, K. and Shioda, T., The Mordell-Weil lattice of a rational elliptic surface, Comment. Math. Univ. St. Paul 40 (1991), no.1, 83--99.